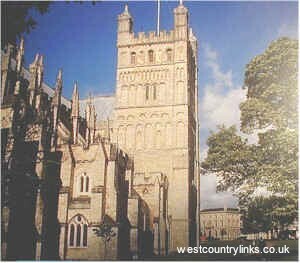 EXETER, County Town of Devon, besides being the gateway of the South-West, is undoubtedly one of its finest holiday centres. It combines the advantages of the town with the attractions of a beautiful countryside. All the usual sports and pastimes of a holiday resort may be enjoyed within its borders or a narrow outside radius. A short journey by road or rail brings the coast and all kinds of scenery, while every facility is provided for those who desire to travel farther. As to its amusements and pastimes, it possesses public lawn tennis courts and bowling greens, a golf course with a view line enough to put the “rabbit” off his game. Exeter is two cities in one, the modern shopping and commercial centre, the ancient area around the cathedral, and the 14th century Guildhall. Sea fishing at Seaton and Sidmouth. Boats can be hired from the beach at Sidmouth and Beer. The best time for fishing at Seaton is between Sept and Nov for bass. Sidmouth Bay is best in spring and summer. Trout fishing on stretches of the Rivers Exe, Otter and Sid. Coarse fishing on the Exeter Canal.